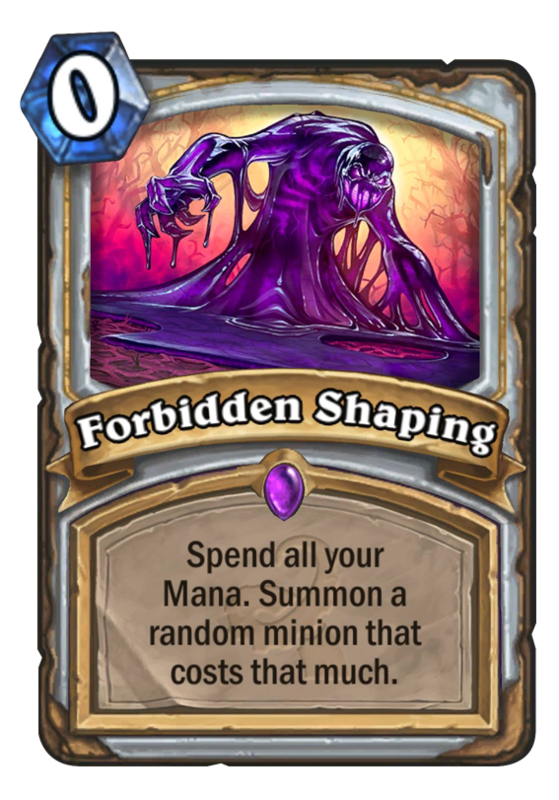 Forbidden Shaping is a 0 Mana Cost Epic Priest Spell card from the Whispers of the Old Gods set! Spend all your Mana. Summon a random minion that costs that much. But the minion arrives covered in goo. Rating: 3.9/5. From 1635 votes. Check out our Forbidden Shaping Wallpaper! The flexibility more than makes up for the RNG. Great card. You can play this ON ANY TURN!!! This card really reminds me of museum curator in that it’s there to “fill out the curve” and it’s flexible. But I think this card is really good. In Arena it’ll be insane. Mana efficiency and curving well is so important for board control and tempo…. and this card will fill out your curve perfectly. 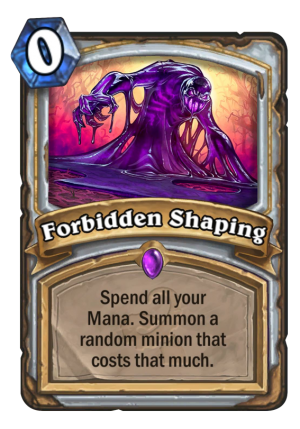 IMO this will be a staple in most Priest decks. Priest is a class where, especially when playing control, you do nothing but heal yourself even if you’re not damaged. This will help fill the gap when you don’t have anything to play. Precisely. I’ve seen a lot of personalities say that this card isn’t nearly as good as people may think it is but I beg to differ. I think that this card can be good in control priest for the very reasons you mentioned. There is a lot of times in a control deck, especially early on where you don’t have anything to play or have leftover mana and this card can help fill that void. The card is quite interesting. Obviously almost certainly underpowered in a strict sort of sense, since if you’re hoping for most specific cards, you can usually simply just run that card unless it’s outside your class. Its real strength is its versatility. I assume you’ll be able to use these cycle of cards after playing other cards to better control the mana you use, which means these are perfect mana curve fixers, and that is really interesting. 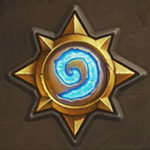 Is a lackluster power level worth it for the most versatile card available at the moment? I think it might be. It means you can be even less concerned with mana curve and more concerned with using more powerful or specific/situational cards, since you’ll have 2 cards in your deck that can fit almost any mana situation you may have, even if inconsistent and potentially weak. I think it could very well be worth it. I didn’t realize you can generate cards that aren’t legal in Standard. Curator value? I find this card actually quite lack luster. With this card we are putting too much in RNG. sure you could get something great, or just get crap. Sure it might work as a one of to help smooth out the curve as well as an option as a finisher. Just dont love all of the RNG with it. lol you’re playing a bloody card game. if you don’t like RNG go play chess. haha I find it so weird that so many people complain about rng. The rng that goes into which card you get when decides games way more than any card they have ever or will ever make. Card games involve the gamble of drawing cards…. these kinds of things are negligable in comparison to drawing all your late game in your starting hand. Exactly! RNG ruins a lot of the game. Like Implosion is extremely broken when it deals 4 damage, and balanced when it does 2, and pure luck determines whether you devastate the board, or just make a normal play. Even more irritating is when you draw a card that could answer a problem minion, and then lose the game because your Crackle hit for 3 damage. Lol. That being said, I find this card to be pretty great because you just need to look at the available pool of minions for the cost you pay for it- for example: 8 Mana is fantastic, while 10 Mana is pretty terrible. This card is actually playable in heavy control priest. As one of the things CP does best is out value his opponent. So it could be a winning condition card.. or it can be used with piromancer. So might see play in constructed.